I'm Heather and I blog over at My Slices of Pie. I'm mommy to Emily, a spirited and slightly silly 21 month old. I work full time, so between the job and the mothering, I stay super busy. Finding time for activities and crafts to do with my daughter means there's never an idle moment spent around our house. If I had idle moments, I might clean up around there sometimes! Who am I kidding? I still wouldn't do it, which is why I'll never be a house wife. Halloween probably takes the cake when it comes to holidays, at least in my book. What's not to love about it? There are no forced family gatherings or obligatory gifts. It's all candy, hopefully cool weather and kids dressed as adorable little monsters, ghouls, princesses and pirates, reality t.v. stars or anything they/their parents want them to be. As far as I'm concerned, it's better than Christmas. To keep my toddler entertained, stimulated and properly educated about the season, we've done multiple Halloween themed activities around the house. 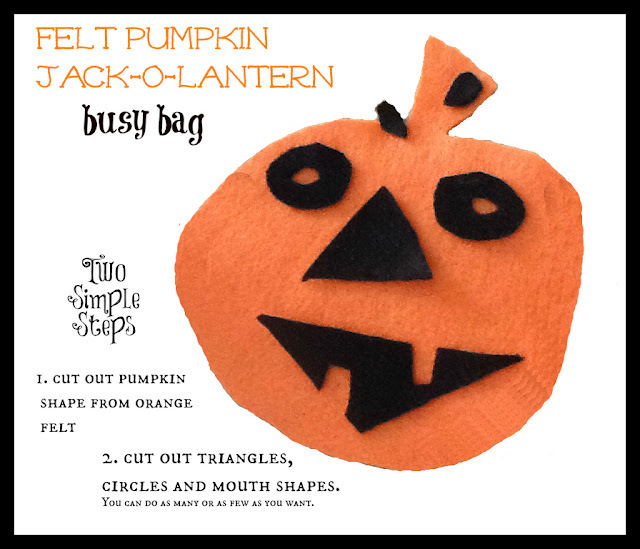 The felt pumpkin busy bag has easily become my favorite because it's cheap, it's easy and it's re-usable. As a huge proponent of busy bags and felt, I combined the two and created a pumpkin cut out from orange felt and multiple sets of eyes, noses and mouths. Whenever we're out to eat or somewhere I need her to act like an angel, I whip out the pumpkin busy bag and she makes faces on the pumpkin. You'll notice, also, there's an ant in our busy bag. 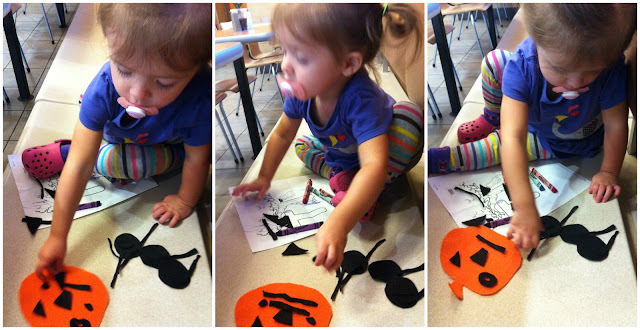 Since we had ample black felt, I cut out a few circles and sticks (all of which double as facial features on the pumpkin) so that we can put together an ant. Ants=an obsession for this girl. Visiting a pumpkin patch remains on our to-do list, but we do have a few small pumpkins plucked from the bins at the grocery store and produce stands that Emily enjoys decorating with stickers. Over and over and over and over again. She adds stickers, she removes stickers. It keeps her entertained. We've made a few polymer clay fairy pumpkins, covered with beads. We have a trip planned to go trick-or-treating at Baby Land General, home of the Cabbage Patch Kids. This could be the only chance for Emily to wear her lady bug costume unless we have a sudden cold front come in. My plan for the actual day of Halloween is to let her paint a pumpkin while we carve ours. It should be worth the mess, right?? I simply cannot do a Halloween post without the mention of COSTUMES! As far as costumes go, since we live in the fine land of Georgia, where you never know what your October weather will bring, we have two options: a fairy (for warm weather) and a lady bug (for cold weather). 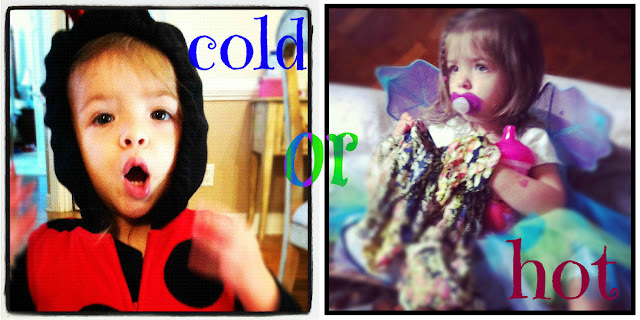 These are both favorites for her, and I'm only slowly learning to yield to HER whims as far as her attire. Just as a quick aside to the fickleness of Georgia weather, we went to Boo in the Zoo (epic failure on my part, as I did not dress her up) and there were children dressed in plush costumes that could have doubled as winter coats good for negative wind chill, which would be awesome for colder climates, but since it was 70 degrees by lunch time, I'm quite certain the kids were roasting, especially the ones on the play ground. Halloween Parenting Rule Number One: Don't roast/freeze your child!! I've really seen some excellent ideas this year, my favorite a set of siblings dressed as a shark (older brother) and a goldfish (little sister). What will your kids be masquerading as this Halloween?? Thanks for sharing these great ideas, Heather!